ANTRIM maintained their stranglehold on the Liam Harvey Cup as they saw off the stubborn challenge of Armagh at Owenbeg on Sunday. It was a pleasing end to what has been a trying year for the Saffrons but, as has been the case for the majority of the season, Antrim didn’t make things easy for themselves. The Orchard county, searching for their first ever Ulster Senior crown, were well in the hunt when midfielder James King was shown a second yellow card on 58 minutes. Referee Eamonn Hasson had little choice after King’s late chop down on Simon McCrory. For the remainder of the contest, Antrim played with the kind of verve and fluency that has only surfaced in spells during the 2016 campaign. In the end, 13 points separated the sides – a margin of victory which probably flattered Antrim slightly. The triumph also marked the end of Dominic McKinley’s reign as Antrim’s interim manager. Along with Terence ‘Sambo’ McNaughton, Gary O’Kane and Neal Peden, ‘Woody’ stepped in after PJ O’Mullan resigned following Antrim’s poor league campaign. However, the managerial quintet will not seek to continue on into next season and McKinley believes the county board should not look for another outside manager. “I think at this moment in time, we need someone in-house,” said McKinley. Any notion that Antrim would have things all their own way was quickly dispelled as Declan Coulter bagged a goal for Armagh in the opening three minutes. Antrim responded well with points from Ciaran Clarke, James McKeague and John Dillon. A hat-trick of Ryan Gaffney frees kept Armagh in touch before Antrim bagged their first goal of the afternoon with Dillon beating Simon Doherty on 24 minutes. The game appeared to be going according to plan for the Saffrons when they bagged two more goals before the break. Eoghan Campbell’s shot was brilliantly saved by Doherty but Conor Carson bundled the sliotar over the line in the scramble which followed. When Clarke landed another major two minutes later when James Connolly found his team mate unmarked and the Ballycastle attacker finished with aplomb to put Antrim 3-9 to 1-8 ahead. Antrim continued to push clear as the half drew to a close with further points from Clarke, Daniel McKernan, Benny McCarry (two) and Connolly. However, Armagh gave themselves a lifeline in injury-time when Cathal Carvill teed up James King for a sublime goal to leave nine between the sides at the break. Armagh bagged another goal shortly after the restart when full-forward Eoin McGuinness blasted past Chrissy O’Connell. The former Down player added a second minutes later when he raised his hurl highest to flick on Kieran McKernan’s long delivery. However, Clarke’s second goal for Antrim in between those scores lessened the impact for the Saffrons. Armagh were then reduced to 14 men when King picked up his second booking and the challenge from the underdogs petered out in the closing stages and Connolly capped off a fine display by scoring a brace of goals in the final 10 minutes. McKinley was satisfied with how is side responded to the various set-backs during the decider and believes the new management are inheriting a talented squad. “Overall, we have to be pleased with what we did,” reflected McKinley. “He hurled for the usual spells, up and down, but they kept at it. “I think enough has been said about the negative side. I think everybody know how good Antrim can be. “The spells we play in, they are very good but in between those spells we do not do anything and that is a worry. I think that’s something that could be worked on. 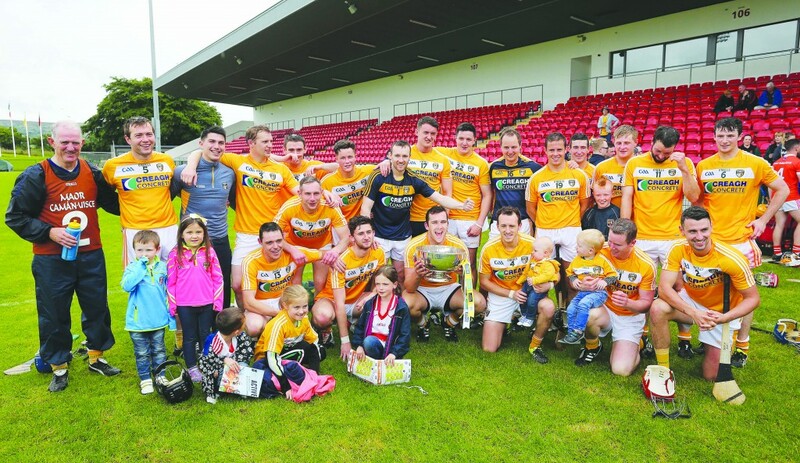 ANTRIM: C O’Connell; S McCrory, N McAuley, B Graham; F Donnelly, P Burke, J McKeague (0-1); E Campbell, D McKernan (0-3); E McCloskey (0-1), J Dillon (1-2), J Connolly (2-2); B McCarry (0-3), C Carson (1-1), C Clarke (2-7, 0-3f, 0-1 sideline). Subs: O McFadden for McCrory (16mins), S Delargy for Graham (26mins), McCrory for Donnelly (47mins), C McNaughton (0-1f) for McKernan (64mins). ARMAGH: S Doherty; C Clifford, A McGuinness, C Devlin; J Corvan, N Curry, K McKernan; F Bradley (0-2); J King (1-0); D Carvill, C Carvill (0-2), C Corvan (0-1); R Gaffney (0-7f), E McGuinness (2-2), D Coulter (1-0). Subs: P McKearney for Bradley (60mins), O Curry for A McGuinness (68mins), A Toal for D Carvill (68mins).